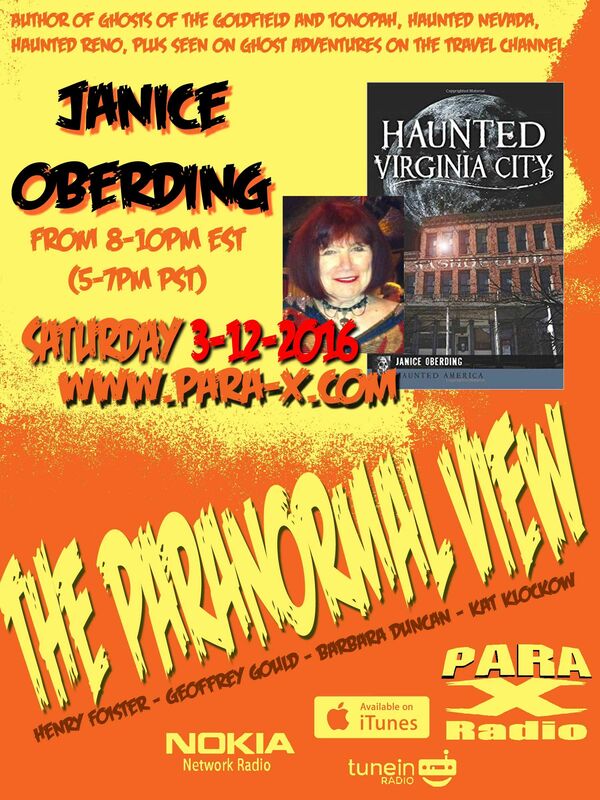 Tonight's guest was Janice Oberding, author of Haunted Virginia City and Haunted Reno, et al. Janice began discussing the history and background of Reno; most if not all of the populace has had one paranormal experience. Ceiling Cat Barbara Duncan asked about Tonopah, considering Janice's Ghosts of Goldfield and Tonopah book, specifically the creepy Clown Motel, and the 1901 since-abandoned cemetery directly across the street. Cater, in the chat room asked of Janice about any travels she may have had abroad; Janice spoke about her visit to Stonehenge. She spent Hurricane Noel inside the Bermuda Triangle. Janice spoke about Henry Comstock and the doomed Grosh Brothers' silver mine. She then discussed the International Hotel in Viriginia City, since burned down and now a parking lot. Coming back from the second break, CC reported our listeners tonight is the US, the UK, Singapore, Australia, Canada, German, and Unknown. Janice discussed camel races, as well as Jack Davis' Nevada buried treasure in Six Mile Canyon, of which she wrote in her Haunted Nevada book. Henry asked about Ma Barker, from Janice's Haunted Reno book. She mentioned the sadly late paranormal investigators and EVP magnets Mark and Debby Constantino, what with her latest book, Demon Song: Mark and Debby Constantino As I Knew Them, available at Janice's website; she's working towards having a Kindle version of it for Amazon. Janice gave out her HauntedNevada.com website, her Facebook page and her @JaniceOberding Twitter profile. I provided my website's Paranormal View hub page on which one can find the show's respective report pages, the show's official website, that we're very findable on Facebook, page, and to Follow me on Twitter. Kat gave out the show's @Paraviewradio on Twitter, her Jinxed Comic site, which is also Followable on Twitter at @JinxedComic. Kat's official site is katklockow.com, and her Miss Grey graphic novel series is at HuntForGhosts.com. CC actually spoke about her cemetery photography at the show's paranormalview.com site, and her being on Facebook as well, and we wrapped out.